Rugged Cordless Scanner: This rugged, industrial scanner has a range of up to 300 feet line-of-sight allowing you the freedom to scan tools on a truck or at the other end of the warehouse. Data Sheet. 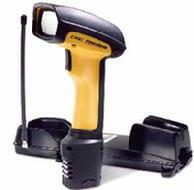 Cordless Scanner: This scanner offers cordless freedom at an affordable price. Its Bluetooth wireless connection will function up to 330 feet line-of-sight. Rugged enough for use in dusty and wet environments, this unit will survive a 6 foot drop. Data Sheet. Corded Scanner: Solid scanning performance, ergonomic design and affordable pricing make this scanner big on performance, but easy on your budget. Connects with 6 foot USB cable. Data Sheet.